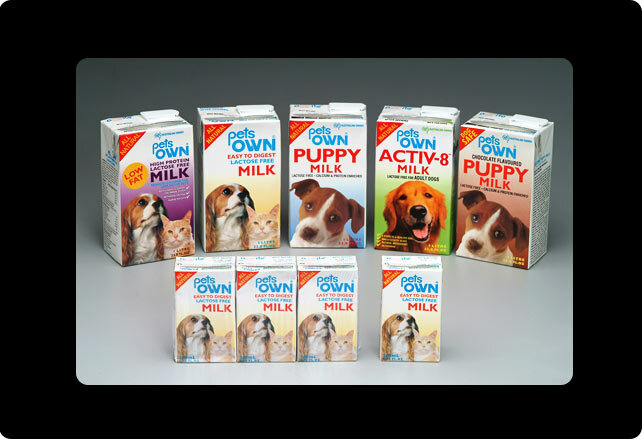 Pets Own Milk is based on cow's milk with the lactose removed. Lactose is the component in milk that dogs cannot digest(1) and which consequently gives the stomach pains and diarrhea, which in turn can lead to poor absorption of ingested nutrients. Pet’s own puppy milk is the best solution for fast growing puppy. WHY THE NEED FOR A MILK DRINK FOR PETS ? Dogs need an adequate fluid intake to help prevent kidney disorders. Pets that are fed on high proportion of dry food in their diet are at particular risk. Milk is an ideal way of providing the necessary fluid intake while at the same time providing an excellent source of nutrients - especially calcium* and amino acids not found in meat based foods. Pets Own Milk with its lactose removed and additional nutrients goes one step further for greater pet health. life as a result of calcium deficiencies. Pets Own Milk is manufactured in premises meeting the highest of international standards for food preparation. It is prepared alongside food for human consumption and contains ingredients of a standard acceptable for use in human grade food. The manufacturing facility has a capacity to pack 96,000 litres of product per day in order to meet any new supply requirements that may occur. The factory has accreditation to ISO 9002 and USFDA approval. The manufacturing facility has modern testing facilities for its full range of milk-based products. The laboratory is capable of carrying out any tests to NATA standard that are required by specific customers. The facility is also accredited by AQIS (Australian Quarantine Inspection Service) and registered with the Department of Primary Industry.